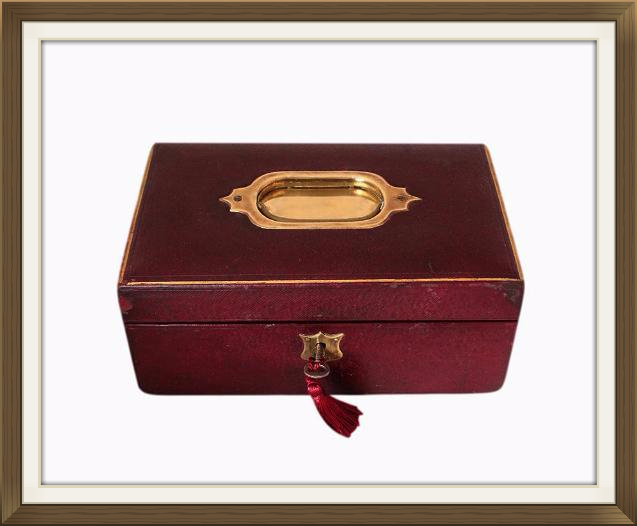 This is a lovely antique jewellery box, dating to the late Victorian period. It is complete with its original working lock and key, and has specifically labeled interior compartments. 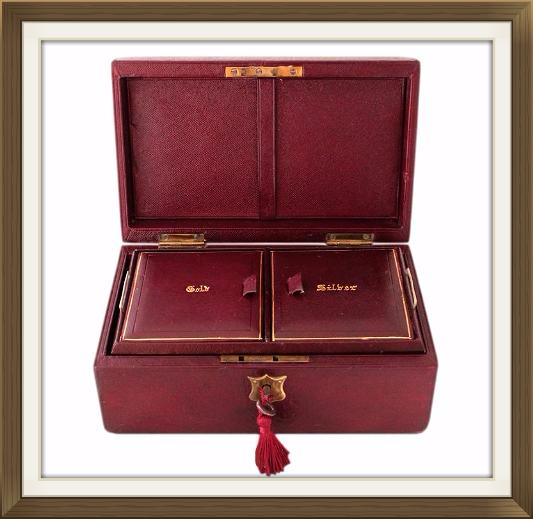 The exterior has a textured maroon leather finish, with tooled gilt decoration along the edges of the lid. It has a decorative polished brass plate to the lid with a brass swing handle, and a decorative shield shape brass escutcheon to the keyhole. 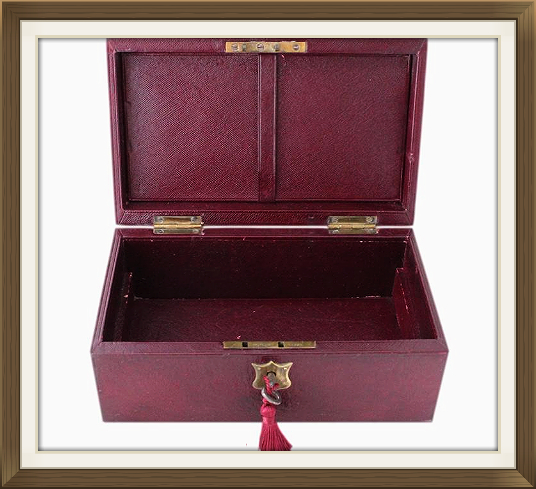 The box is complete with its original key and also its original brass lock and stop hinges. These prevent the lid from extending too far back. The lock has a protected patent and is accordingly stamped PROTECTED 13875. 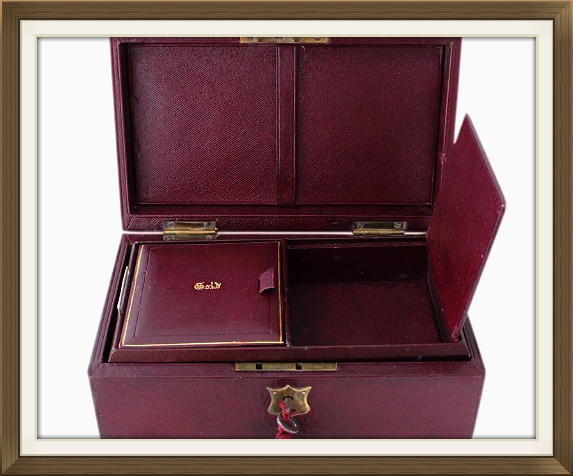 The interior is also leather finished and has its original lift out storage tray with 2 individual compartments. The lids to these are specifically labeled Gold and Silver, in beautiful tooled gilt italic script. They also have tooled gilt decoration to their edges, and matching leather pull tabs. The tray has metal side handles and can be easily lifted out of the box by these. Beneath the tray is a further single compartment which is large and shallow. This is also finished with leather. 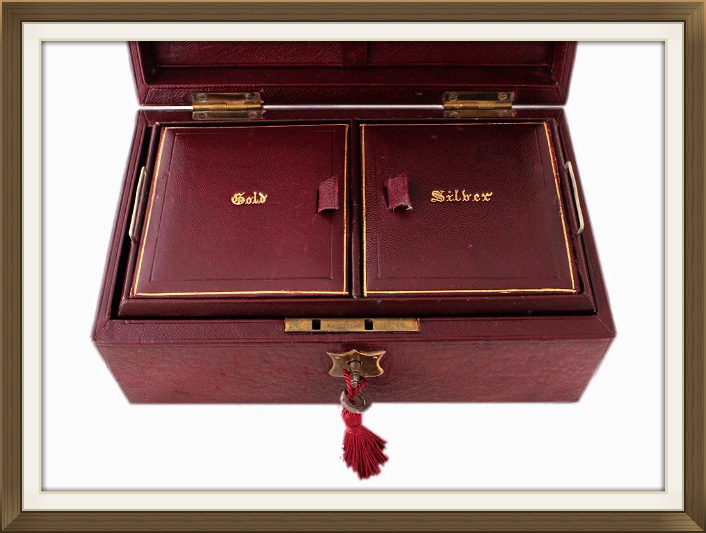 The specifically labeled compartments in the tray are a wonderful feature of the box, and are lovely for those who like to keep their gold and silver jewellery separate. The inside of the lid has a leather strap which was designed to hold letters and photos etc. This is another lovely feature. This box is in very fair condition for its age. There is some minor wear to the leather from handling, mainly to the front of the lid, at either end where its been lifted up. There is also some minor friction wear on the bottom of the box, from where its been moved around on furniture. 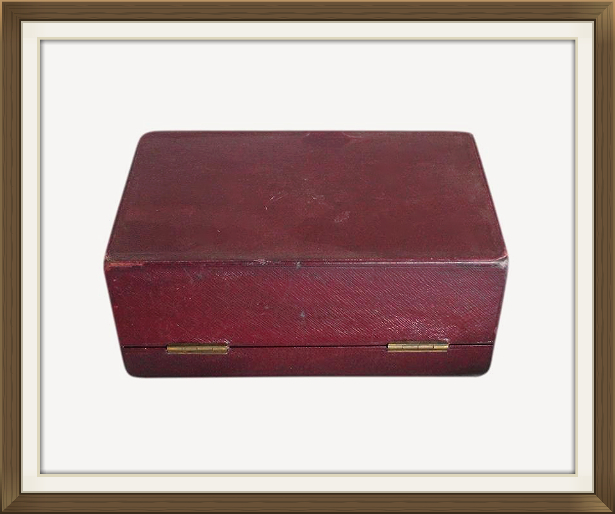 The wear is as we'd expect on a genuine antique box, that has been loved and used for its purpose. There is minor light wear to the leather in the interior, and slight misshaping to the right side metal handle on the tray. The lock and hinges are in excellent working order and the box locks securely with its key. Each 8.7 by 8.5cm with a 2.5cm depth. 18.0 by 10.5cm with a 2.5cm depth. International postage is delivered fast within 3-5 working days to Europe and 5-7 working days to the rest of the world. Postage is by Royal Mail International Tracked and Signed.